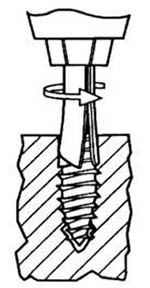 UnScrew-Ums Sets Contains 5 Items selected in specific range. Packaged in a plastic container. Handy One's Set 5 from 1/8" to 1/4", Boat Builders Set 5 from 5/32" to 5/16"
UnScrew-Ums Basic Set 6 From 1/8" to 5/16" 2" length, Packaged in a plastic container. Indivual Un-Screw-Um's range in size from 1/16" to 1/2" Select diameter from pull down window. 1/16" X 1" 3/32" X 1 3/8" 1/8" X 2" 5/32 X 2" 3/16 X 2" 7/32 X 2" 1/4 X 2" 5/16 X 2" 3/8 X 2" 7/16 X 2" 1/2 X 2"
Indivual Un-Screw-Um's in the 3" range sizes from 5/32" to 1/4" Select diameter from pull down window. 5/32 X 2 1/2" 3/16 X 2 1/2" 7/32 X 3" 1/4 X 3 1/2"
Indivual Un-Screw-Um's in the 4" range sizes from 5/16" to 1/2" Select diameter from pull down window. 5/16 X 4" 3/8 X 4" 7/16 X 4" 1/2 X 4"